Before grunge, before the current garage revival, there was The Fuzztones. Combining ‘60s fuzzbox sound with the aggression of ‘70s punk, The Fuzztones became underground legends. On March 26, Cleopatra Records is releasing a collection of rare demos, alternate tracks, and unreleased live and studio tracks that span The Fuzztones thirty-three year career. From the jangly guitars and harmonica on “Lord, Have Mercy On My Soul” to the raucous, unbridled “Kick Out The Jams,” the spirit and energy of old school rock ‘n’ roll pours out of each track. Also included are guest appearances by Ian Astbury (The Cult), Rat Scabies (The Damned), and James Lowe (Electric Prunes) as well as radio and television interview soundbites (including one with Martha Quinn for MTV). Founded in 1980 by Rudi Protrudi, The Fuzztones indie cred has kept the band’s reputation going for more than three decades. One of few psych/’60s revival bands to get a major label deal in the ‘80s, Fuzztones made a lot of noise from its hometown of NYC to L.A., and then in Europe. They continued to release more than a dozen albums independently. In addition to Rudi curating this collection from the band’s vaults, this year promises to include both Rudi’s autobiography and a band documentary. 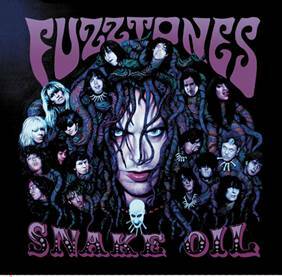 The Fuzztones SNAKE OIL is out March 26, 2013, in stores and online. The 2-CD set is MSRP $14.98 and comes in a sleek digi-pak.